November 2, 2017 November 1, 2017 Amanda B.
I started to collect loose part materials about 5 years ago. We use them in every area of the classroom, and our students love to use them in their play. I have been asked a few times to share what materials we have, and where I got them from. I will do my best to tell you what I have and where I got them, but some of these materials came from my teaching partner, or other teachers on our kindergarten team. So I hope my pictures provide you with inspiration on how you can incorporate loose parts into your classroom and some ideas on where to find them. Materials can be found just about anywhere; your home, hardware store, craft store, outside. Basically, anything fun that you see that you think would inspire your students can be added to your loose parts collection. Can be found in just about any dollar/craft store. They come in different colours and sizes. In my experience, students love using gems in their play. They can pretend the gems are so many different things, and enjoy their texture and colours. Depending on the time of the year, stores might have different colour of gems available so it’s worth looking back often to see what other items they have. These are from Halloween at the Dollar Store. These wood buttons are great for fine motor practice for a number of different activities. They can thread them, manipulate them, use them with pipe cleaners. They are versatile and come in different materials and colours. 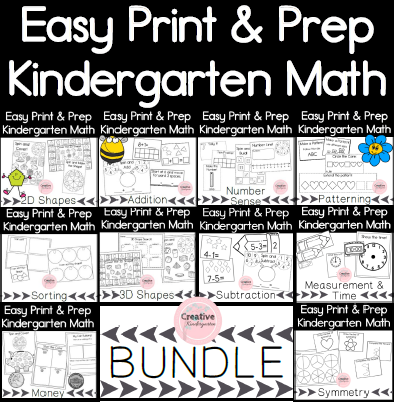 They can be used with math activities, literacy centers, or in dramatic play centers. These wooden buttons are from a dollar store called Dollar Tree (the amber gems are from the craft store Michaels). More items that can be found at the dollar store that students can use during math and literacy centers. Our students love the colours and how they can use them to outline and build sight words or numbers. We have a set of these different sight word, letter and number outline sheets that we can add to our loose parts centers to inspire students to create during literacy centers. Rocks can be found just about anywhere, and they are so perfect for kindergarten students. There is something about rocks that invokes the imagination of children, and they transform into so many different things. The colourful wooden sticks are great for different loose parts activities, students love creating patterns and geometrical images using them. These wooden letters were bought at Dollarama, and I bought the wooden numbers (not pictured) at Michaels. They are great for introducing literacy and numbers into your loose parts center and allow children to use them in different ways. I know some people would argue that including these does not truly constitute loose parts, but I would completely disagree. I have noticed students using these letters in different ways, and they are fun to build sight words with! I made these over the summer for our students to use. You can see how I made these in my previous post by going here. These clear plastic containers are a great way to store all your loose parts when they are not in use. They are on the shelf where students can take whatever they need, and they can see what is there. You can get colourful popsicle sticks at the dollar or craft store, they also come in different sizes. This student used them to make tally marks while at our loose parts center during math centers. She rolled a die twice and represented the number using tallies. She also made the addition and equals sign and came up with the answer and represented it again with tallies. She then used our subitizing mushrooms to represent the numbers also. This was all done on her own and I was really impressed with what she had done with the materials! We were working on labelling our pictures during our Guided Writing the week that this picture was taken. So the child labelled the picture they made with gems! Such a fun way to use the materials, and they are still working on their literacy skills. This one really blew me away! This student used our wooden sticks to make patterns (we haven’t even started that in math yet), and labelled the picture! This student wanted to make shapes, patterns and letters with loose parts! This is our dramatic play center. One of our students asked me if they could take gems there, to make ‘Halloween treats’. Love how they were using the different materials in their play! I hope you have found some inspiration for your own loose parts play with these photos. I will continue to post pictures of our loose parts play in action, so make sure you check back often for more ideas. What materials do you include to inspire your students to play and learn? I love your wooden disks with letters on them! Your kids must have a lot of fun with all of these pretty materials to work with!